Togakushi Shrine Hoko Shrine (戸隠神社、宝光社) is one of three shrines in Togakushi. It was built in 1058 by the 70th emperor Goreizen. It enshrines Amenouwabarunomikoto. The steps to the shrine has beautiful cedar avenue and it is considered as one of power-spot in Togakushi. 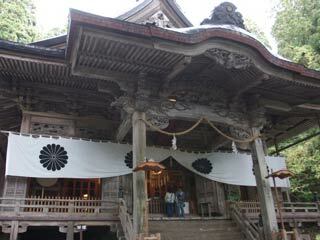 The god is the son of Yagokoroomoikanenomikoto, enshrined at Chusha. He has power is good for arts, relationship, safe delivery, avoiding disaster and family happiness.